While in Montana a few years ago I took this photo of this Mountain Lion. I love how the reflections reflect the face in full view along with the splash of the water and ripples as he is stepping in. I got several shots of this Mountain Lion and hope to do several of them with Colored Pencil and maybe do a piece in pastel. I decided to do this one on beige Suede Board. I will be filling in the drawing completely, there won't be any of the suede board showing as I did with the Rottweiler below. I love how the suede board works with the colored pencils. The interesting thing with the suede board is you can add your highlights on top of dark pencil and it shows up quite nicely. The suede board works very similar to a sanded surface. If you haven't tried it you should. I now have the contour drawing done and I'm starting to color it in. I should have an update of my progress in a few days or so. If you have any questions at all feel free to speak up. 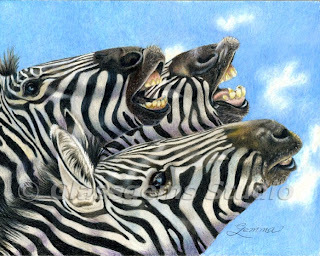 Finally Back - Zebras Are Done And A New Portrait Too! It's been a long time since I posted and I do apologize for that. We had a few deaths in our family and my Mother was very ill for quite some time. She is doing well now and things are finally coming back to normal. 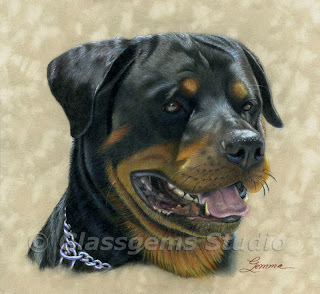 During the time I was away from my blog I was asked to do a portrait of a beautiful Rottweiler named Dutch. Dutch is the Father to the litter of puppies my dog, Harlow, gave birth to in August. She had seven cute little puppies and we decided to keep one of them. We were able to find homes for all of the others. We named our puppy “A National Treasure” and his call name is Cage. I just hope he turns out to be as beautiful as his Mom and Dad. Well anyway…. The portrait I did of Dutch was done on Suede mat board, the color is called Moccasin. I love the way the Suede board works with the Colored Pencil. One of the things I like best about the suede board is you can add the lights on top of the darks and they show up very nicely. It behaves a lot like a sanded surface. The other nice thing about it is you don’t have to do the background; you leave the suede board in that area, which seems to work quite well on a portrait. I’m glad to be finally be back updating my blog and I promise I will be doing updates much more often than I have in the last 4 months, so please come back and check for more updates.